They're hoping to take on Aeroplan. A Westjet Boeing 737-700 takes off at the International Airport in Calgary, Alberta. 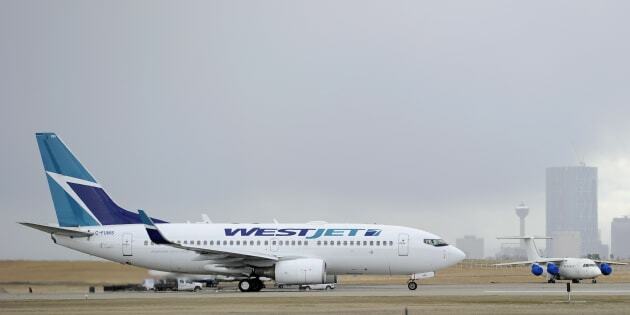 TORONTO — WestJet Airlines Ltd. is teaming up with the Royal Bank of Canada to create a new loyalty program that aims to attract a "very substantial" group of "very unhappy" customers from the Aeroplan program, which its rival Air Canada is preparing to replace in 2020. The tail of a WestJet plane is seen dwarfing the Calgary skyline before the airline's annual meeting in Calgary on May 3, 2016. A Royal Bank of Canada sign is shown in the financial district in Toronto on August 22, 2017.